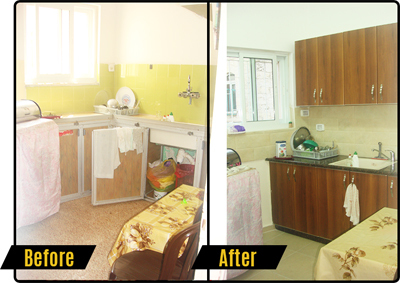 The Housing Rehabilitation Program (HRP), established in 2004, was developed by HCEF to provide suitable housing for needy Christian families in the Holy Land, through the renovation of existing, but substandard homes. The program provides employment for hard pressed Christian craftsmen and laborers. Most of the homes which HCEF upgraded have not received any type of repair in more than 30 years! To help Christian families remain in their homes by providing safe and decent living conditions to the most needy among them, thus discouraging emigration. To create job opportunities for skilled craftspeople and for laborers, to include unemployed members of the beneficiary families, where possible. To support Christian craftspeople, suppliers of materials and transport services, and other individuals involved in small businesses in the Holy Land. Build solidarity with the ‘forgotten’ faithful by visiting the Holy Land, working alongside those who are rehabilitating homes, and breaking bread with the families, thus getting to personally know them. Donate funds to support the Housing Rehabilitation Program. Encourage others to get involved. Church members, organizations and groups may act jointly to sponsor specific repairs. My daughter lost her privacy when the crumbling ceiling in her bedroom forced her to share a room with my son. 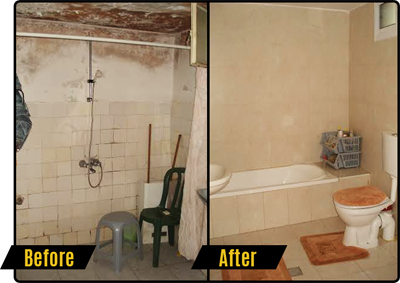 Thanks to HCEF, her ceiling is fixed and she is able to sleep safely in the comfort of her own room once more. I was engaged for three years and we were forced to keep putting off our wedding because I couldn’t afford the repairs needed to make my house livable. HCEF came in and painted the place and installed a new kitchen. They made my marriage possible. I was engaged for two years with no place to start a new family. After I got in touch with HCEF, they helped me renovate my house and I was able to get married and start a new Christian family in no time. Thanks, HCEF! The humidity in my house was unbearable; in my son’s bedroom, it cultivated mold and caused him to become ill with pneumonia. As parents, we wanted to do everything we could to create a safer environment for him, but we couldn’t afford to. HCEF was able to greatly reduce the humidity in my house. I cannot begin to express the depth of my appreciation to HCEF for helping my ailing son. 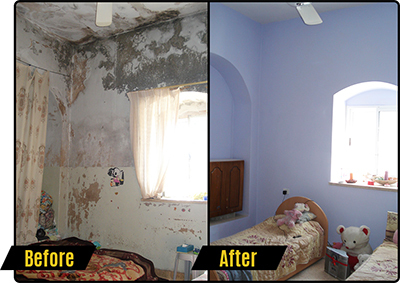 I will help to improve living conditions for Christians in the Holy Land by supporting the HRP! There are many ways to donate to the Housing Rehabilitation Program. I would like to support and donate for HCEF’s Mission!